Subaru has been on-fire (figuratively) for years now in U.S. sales growth, and they’re looking to grow even further by showing off concepts for a new Impreza wagon and full-size SUV at this year’s Tokyo Motor Show. I’ll start with the boring one - the SUV concept. Well, boring unless you’re a Subaru shareholder. That thing pictured up top is set to be Subaru’s newest attempt at a full-size “lifestyle” sports-utility-vehicle, which should make every “weekend adventurer” in America squeal from their tent in someone else’s backyard. 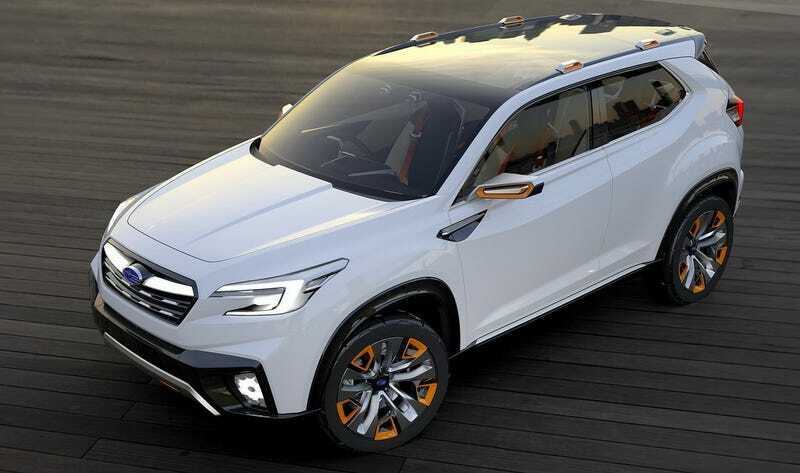 Subaru isn’t making this Subaru SUV - it’s called the VISIV concept - with only love this time either, as it previews Subaru’s new platform (along with the Impreza concept). The SUV features a turbo-engine hybrid set up with the use of electric motors offering the brand’s famous 4WD setup without the annoying hump for the prop-shaft running through the interior. Subaru is also upping its safety image with the VISIV concept featuring an active automatic braking system, surround-view radar sensors, vehicle-to-infrastructure communication, as well as automated parking. The squared off headlights and taillights in the sketch look bold, and the car shares the exaggerated rear-hump of the WRX. The steeply sloped roofline promises something slightly sexier than the current model. That should make us all very excited, though there is no word yet about whether there are plans to revive a 5-door WRX or STI, or even transmission possibilities, though a manual is offered on the current generation. We should get to see the concept cars in the flesh in the last week of October, which is when the show opens its doors to the press. The new Impreza hatch should show up around late-2016, with the new full-size SUV following it. The new platform on the Impreza will also show up in the entire lineup through model refreshes over the next few years. Subaru also promises direct-injection on all engines, as well as cylinder deactivation and leaner combustion by 2016, with plans for its first plug-in hybrid model to show up in 2018. The ultimate goal is to achieve over one million vehicle sales in a fiscal year by 2021. I’d say Subaru is right on track.